Happy Pi Day! Once you’re done celebrating this magical number, you should beware the Ides of March. Then commence donning of the green for St. Patrick’s Day… with all of these festive days to observe, it’ll be next weekend before you know it. An enjoyable late day walk at Durand Eastman Park uncovered more species than expected, but my favorite were two brilliant Eastern Bluebirds. Corey enjoyed the weekend’s warm weather and took the morning on Saturday to look for early migrants. 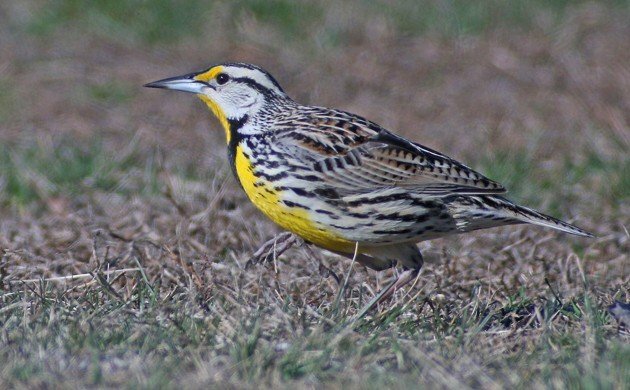 The best of those that he found and the Best Bird of the Weekend for him was an Eastern Meadowlark on the soccer fields at Fort Tilden which showed no fear as Corey digiscoped it from the comfort of his car. This was a great birding weekend for us. We headed south from NJ to FL. The best was arguably a snail kite fighting with a norther harrier, close second a Florida scrub jay. Burrowing owls, barred owls, Crested Cara Cara and lots more goodies. All photographed. Oh and a gorgeous Eastern Meadowlark singing atop a fence post. Nothing this weekend, but I did book an exciting trip for Easter Weekend. Well, I saw my first Frogmouth ever, Tawny Frogmouth, and was blown away by how big they are. I thought they were just a different form of nighthawk… Sadly, the bird was seen at Frankfurt Zoo, so obviously it doesn’t really Count for Best Bird of the Weekend. Concerning wild birds, I enjoyed a nice male Goshawk on the way from Heidelberg to Frankfurt Zoo. First time ever to the Mexico City area…..9 new life birds, with Bronzed Cowbirds, Rufous-back Robin and the Nashville Warbler leading the way. Also a fully Black-eared Bushtit! Was able to get great photos of all! !